Dionaea muscipula ‘Fondue’ was found at the Carniflora open day on May 17, 2008. The most spectacular feature of this new cultivar is the strange shape of the traps — they look like molten or melted plastic (see Fig. 1). 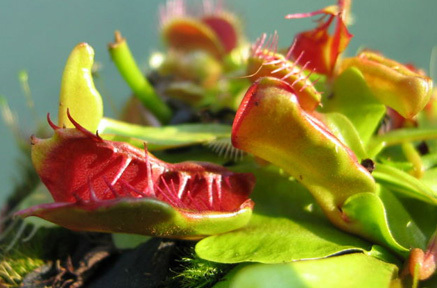 During spring, the traps can look like the typical Venus flytrap, but during summer and autumn most of the later traps look molten (see Fig. 2), even petioles can appear molten (see Fig. 3). 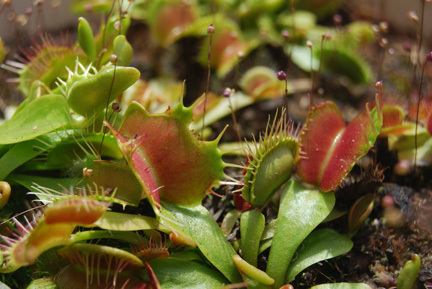 Sometimes plants do not produce typical traps in the spring, but directly produce molten traps. 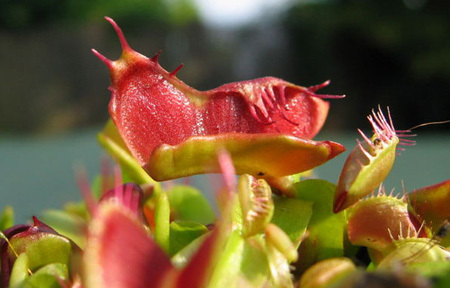 Because of the shape of the traps, this Venus flytrap does not catch much prey so the inside of the traps are a deep red color during most of the year. Fondue means molten in French. Vegetative propagation is necessary to maintain the unique features of this plant. Figure 1: Molten traps of Dionaea muscipula ‘Fondue’. Figure 2: Normal and molten traps of Dionaea muscipula ‘Fondue’. Figure 3: Molten petioles of Dionaea muscipula ‘Fondue’. Many years ago I received this clone from Tom Kahl, who had received it from Leo Song. Leo managed the greenhouses at California State University at Fullerton for many years and was also co-editor of CPN for a long time. Sarracenia ‘Godzuki’ is a clonal selection of a cross Leo did between S. oreophila and S. minor (S. oreophila × minor). My nursery California Carnivores has sold and distributed many of these plants under the hybrid name Sarracenia oreophila × minor. 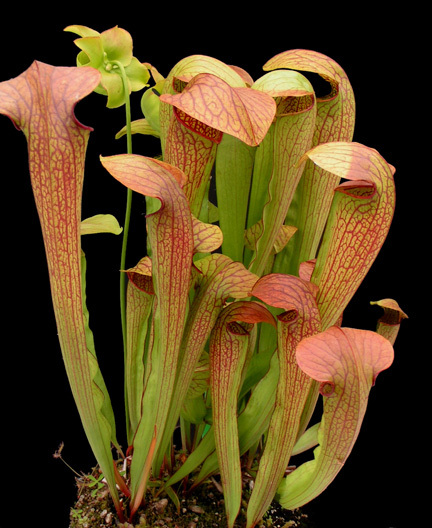 Sarracenia ‘Godzuki’ is a vigorous, fast-growing plant that readily spreads and clumps in cultivation, producing many pitchers throughout the growing season. The pitchers average about 25 cm in height, but can reach up to 45 cm. The domed, semi-curved lid completely covers the mouth and its exterior is heavily veined and becomes copper red in full sun, while the interior becomes equally flushed with a bronze-red coloration. 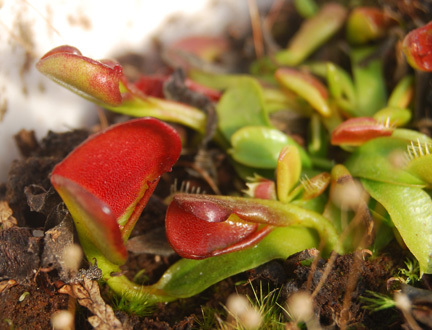 As it ages, the entire tube of the pitcher can become rather bronzy red against a green to olive background. Several things are particularly noteworthy in S. ‘Godzuki’. The medium-sized bright yellow/green flowers open simultaneously with the opening of the first pitchers of the season (see Fig. 4 and Front Cover). The flower petals can last in prime condition for up to three weeks, around three times longer than typical American pitcher plants. It is most unusual, but we have never seen pollen released by the anthers, however the stigmas are receptive to the pollen of other Sarracenia. Clumps of this clone can produce a floriferous display in spring. All of the pitchers face inward, toward the center growth point of the plant. The plant is very cold hardy, since S. oreophila is one of its parents. It is the lizard-like appearance of S. ‘Godzuki’ that inspired us to name this clone after the son of Godzilla, a famous character in many Toho Film Productions. 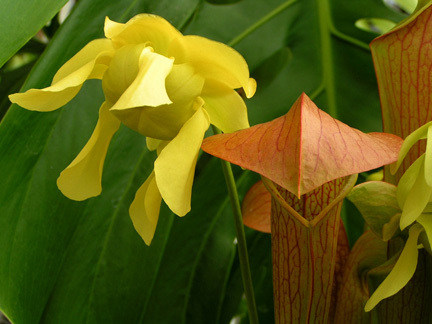 Figure 4: Sarracenia ‘Godzuki’ pitcher and flower. Photo by Damon Collingsworth. Front Cover: The cultivar Sarracenia ‘Godzuki’. Photo by Damon Collingsworth. 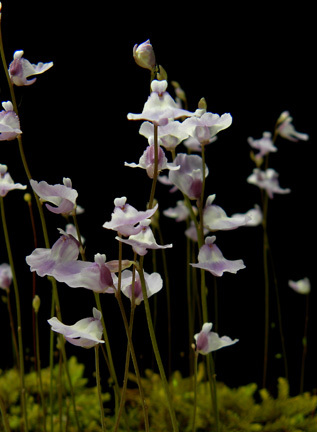 Utricularia livida is a popular plant in cultivation, however most clones of this species originated from South Africa. Strangely enough, this species is also widespread throughout Mexico. The Mexican variety is even more attractive in flower than the African variety and is equally easy to grow. It flowers prolifically, most often from spring through autumn, but it can bloom in winter as well if kept warm and in high light levels. It is tolerant of light frost and brief freezes. The flower stalks average 7.5 to 15 cm in height but can be taller, with upper portions of the stalk each lasting several weeks in bloom. The flower’s apron-like lower lip is slightly irregular along its edge, suffused with purpleviolet coloration, and measures nearly 1 cm across (see Fig. 5). The tiny upper lip is two–pronged. The forward facing curved spur is hidden below the larger lower lip and is also violet in color. There is no yellow throat in the spur, as in its African sibling. It has never produced seed to my knowledge, but is easily propagated through divisions. The sizeable surface stolon are irregularly tear-drop shaped and measure roughly 1 cm in length. We have named this plant Utricularia ‘Merrie Heart’ after the affectionate spelling Francis Ernest Lloyd used for his beloved wife, Mary Hart. Mary was born November 6, 1865 in Boston, Massachusetts and was a graduate of Wellesley College. She was a professor of Biology at the Western College for Women, in Oxford, Ohio until she married Lloyd in 1903. She died in 1948 in Carmel, California. Lloyd’s obsession was Utricularia, and U. lloydii is named after him. The Lloyds lived in Mexico for some years. See my article “Lloydie” in CPN, Vol. 39, No. 2, June 2010. Figure 5: Utricularia ‘Merrie Heart’ flowers.